I remember it like it was yesterday. Zach + I went on a date in Conway which ended like it always does- by grabbing a coffee + cake pop from Starbucks. We got our items + sat in the comfy chairs scrolling the internet looking at puppies. (Side note: We love luna, but we were uneducated about breeders + shelters.. Next doggie friend we get will be from a rescue/shelter. There are WAY too many puppies that need good loving homes at your local shelter. And chances are, they are just as smart and friendly as the one you will be paying a good bit for from a breeder. There are even pure bred puppies at shelters sometimes too.) While searching we found the cutest little Australian Shepherd + we fell in love!! That little nub and cute little fluffy booty had us wrapped around her finger. Unfortunately after looking more in depth we saw that her adoption status said "PENDING". We were so bummed + we knew that she wasn't for us. So we kept looking, but had no luck. Finally I said I was just going to message the breeder + ask if for some reason it happened to fall through to PLEASE let us know! They immediately responded saying she was obviously waiting to be picked up if the owner could talk his wife into it. Our hearts were broken again. Until, I received an email saying it wasn't going to work out + Luna was ours if we still wanted her!! We were SO happy. We packed our truck + headed for Springfield, MO. My little sister came along for the ride. The couple who were the breeders were so nice + they had so many dogs. You could truly tell they loved their dogs. They all got to come inside + get to cuddle. They really were such nice people! Every litter they have they take turns getting to pick one to keep. At that time they had a total of 17 Aussies. 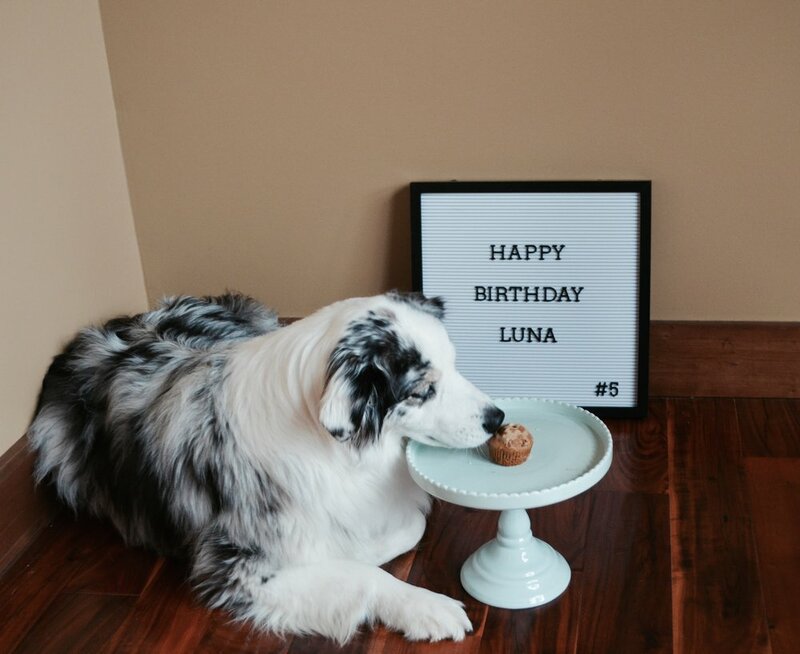 The husband was super upset because it was his wife's turn to choose + if it was his, he would have picked Luna. He said that every time he came to feed the puppies she always sat under his chair and hung out with him. He actually shed a tear when we loaded her in our truck to head home. Our lives forever changed that day. We became parents. We treated her like a child from day one. To say she is spoiled is an understatement. At one point she had 2 big bins stuffed with toys. She was an only child. She has been through it all with us. When we had 2 legged kids we were afraid she'd be jealous + not like them. Of course it was a transition for her, but I think she wouldn't have it any other way! She just LOVES to get her hair pulled from her brothers and get climbed on. What she really enjoys is when big brother (Ezra) is finished with his food and says "Here sissy, eat!". That's when she really loves being a big sister. Today is her F-I-F-T-H birthday. Man time has flown by. She is no longer our little baby girl. We wish she could be our 'forever' dog. Anyone else have/had a dog like that? Sure she can be a pain at times. Especially when a stranger comes toward our path on hikes, or comes near our car, or just happens to wink our way. She's a bit protective at first. So many people stop to ask if they can pet her. And we feel bad every time we have to say "No we are sorry, she isn't the sweetest towards strangers". Its her beauty that attracts people. One of the downfalls of not being able to socialize her at a young age is her protectiveness towards people. But she truly is a loving dog. Once she realizes that you aren't going to hurt us or the kids, she will be your best friend if you throw her a ball. That. is. her. crack. She can chase a ball all day long. No matter if she can even stand up or breathe. Common in a herding dog. They do not know when to stop. And occasionally you have to make them stop. But we wouldn't change her for the world. She loves us just as much as we love her. And today is her day! 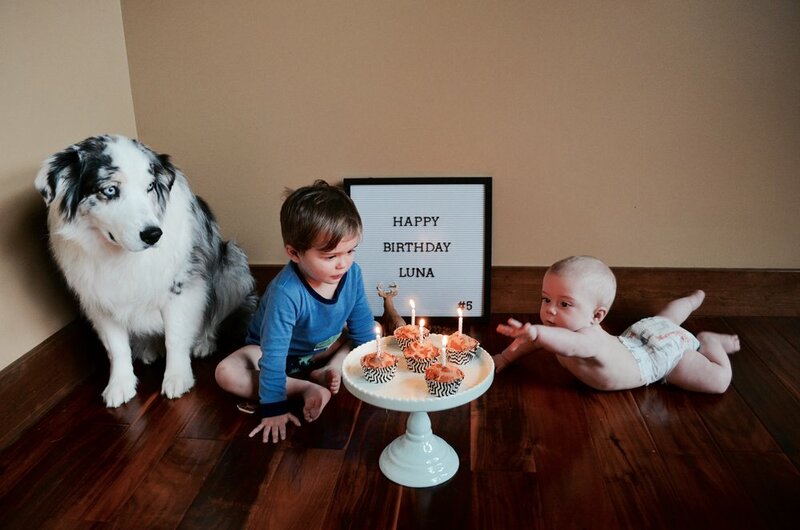 So we celebrated with baking doggie cupcakes (that Ezra approved of too) + lots of snuggles! We LOVE you sissy! AKA Luna. Scroll down to the bottom for cute pictures + a yummy dog treat! Can't you tell she just adores having brothers?! She's still learning that its not all about her 24/7 like it was 2 and a half years ago.